Welcome to Onit! If you’re a new user, this article will give you a quick tour of the different components you’ll be using to work within your environment. Keep in mind that Onit is a highly-configurable platform so navigation and layout will vary across environments. The permissions you’re granted as a user also affect what information you’ll see and what actions you’re allowed to take. In Onit, apps are configured to contain records. You may have a Matters app containing a record for each matter your company needs to keep track of, for instance. For some apps, you'll likely be able to access a grid, called an App Dashboard, containing information on all the records you are allowed to view in that app. More on App Dashboards below. You can also access a record's View Page, where you may be given permissions to edit, comment on and take action on a record. More on View Pages later. 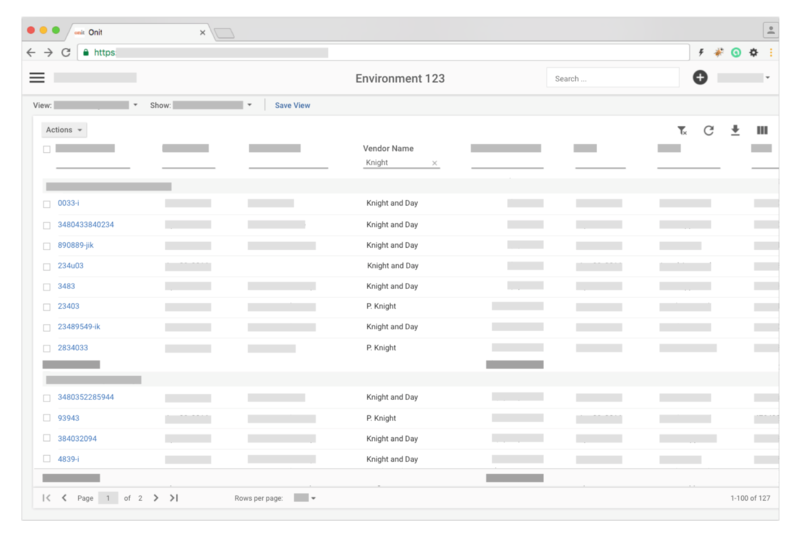 The biggest difference between environment setup is based on whether or not a Suite is used in an environment’s configuration. A Suite is a customized display of the most important information across your environment and contains Widgets, which are used to organize relevant data. You may have a Counter Widget that tallies the number of invoices pending your approval, for instance. Your environment may or may not have been configured with a Suite. 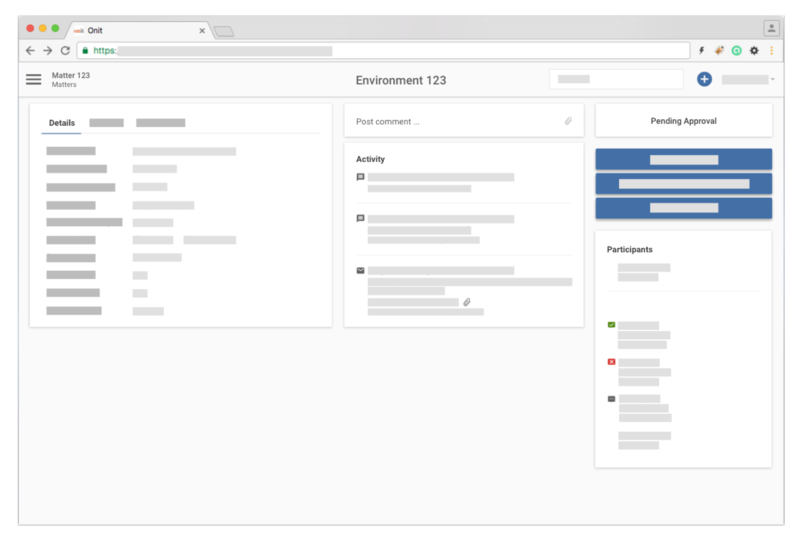 You can tell whether your environment has a Suite configured for it depending on whether you land on the Apps Homepage or on a Suite Dashboard page when you first enter your environment. Note that for environments without a Suite, you can filter for apps with the Filter Sidebar on the App Homepage. These filters are preserved after you navigate away and come back to the Apps Homepage so if you're wondering why you're seeing a limited set of apps, make sure you've removed any filters from this sidebar. To navigate your environment, use the Navigation Menu. Click the Menu icon in the top left corner of the header to open your Navigation Menu. The Navigation Menu will stay open until you close it by selecting the Navigation Menu icon again. Your Navigation Menu will contain links specific to your environment and may be organized differently than the example above so experiment with selecting the links available to you and see where they take you. Some of the links in your Navigation Menu, (and, provided your environment is configured with a Suite, in your Suite Widgets), will lead you to an App Dashboard where you can view a grid containing each of the records you have access to that belong to that app. Provided the permissions, you will also be able to filter and sort records from this grid to quickly find the records you need to access or export sets of record data to an .XLSX file. To filter your data select the line below the column name, type in the box that opens on selection, and hit OK or the Enter-Key. You can clear a specific filter by selecting the 'x' to the right of the fitler text. To clear all filters applied to a grid, select the Clear Filters icon in the toolbar. You may find yourself needing some more dynamic filters. For instance, you may want to filter for any records whose Phase is not Completed or find any records whose PO Number Field is empty. See our article on handy grid filters for information on different ways to filter for data. You can add or remove Fields by using the Field Selector. Open the Fields Selector from the right-most icon in the toolbar and drag and drop Fields between the Available Fields and Displayed Fields columns. You can also group rows of data by their values. Grouping functionality is also accessed from the Field Selector. You can quickly export the data you've organized and filtered for to an .XLSX file by selecting the Export icon from the toolbar and selecting Export. Views are saved sets of grid data. Your App Administrator has likely configured a few different Views for your data viewing convenience. To select different Views, used the View Selector in the top left of the grid. Once you've got your data all organized just how you like it, you may want to save your own personal Views. To save a View, select the Save View button next to the View Selector, provide a name for your new View, and select Save. All Transactions: When this filter is applied, all the records you have permission to access will be displayed (provided no other column filters are set to restrict data results). My Transactions: This filter narrows down the grid to just the records you are a participant on, including those that you requested. My Pending Work: This filter only shows records you have a pending endorsement on (i.e., you need to provide an approval or rejection on). When made available for an app, this special filter is available to the right of the View Selector. Provided necessary permissions, you can execute bulk actions on records from the grid. Select the records you wish to perform an action on with the checkbox to the record's left, select the action from the Actions dropdown, and confirm you want to execute the action. The bulk actions available in any given app will vary. If you've made changes to records you may need to refresh the grid. Select the refresh icon in the toolbar to refresh. You can adjust column widths by grabbing the handle on the right edge of the column's header and dragging to the desired width. To sort a column in descending/ascending order, you can click the column name. To reorder columns, grab the column header and move it. From a record's View page, you can interact with a record. Provided the permissions, this includes editing a record's details, sending comments about a record to other participants, taking actions on the record such as providing approval or generating documents, and more. Note that your View Page layout will vary depending on configuration and permissions. You can access a record's View Page by selecting the record's hyperlink from an app's dashboard. Note: If you have a Suite configured for your environment, some widgets on your Suite Dashboard may also provide direct links to a record's View Page. If you are given the necessary permissions, you can edit a record's details by selecting the Edit button on the Details panel, making your edits, and then selecting the Update button to save. To post a comment on a record, select the Post Comment... button, enter your comment, select whom it should be sent to, and select Share. Comments are posted in the Activity panel, (along with any emails sent to the record's unique email address). Recipients of comments will receive an email notifying them of the comment. A panel in the top right corner of a record's View Page may exist and indicates which Phase a record is in. Some users are given permission to advance the Phases of a record, while some apps only allow for automatic advancement of records based on a configured workflow. You may have access to some action buttons in the right-most column of your record's View Page. What these buttons do is dependent on what actions they were configured with. 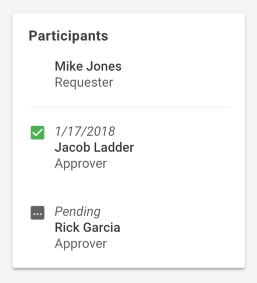 For example, in the screenshot below, the first button can be used to add new participants to a record while the second button generates a spreadsheet of invoice data associated with the matter. In the right-most column of a record's View page you'll also find a Participants panel where all the participants of a record are listed. Participants are sometimes given an endorsement status that allows them to either approve or reject a record. Remember that in addition to using the Navigation Menu to navigate around your environment, you can also always use the browser's back button to return to the page you accessed the record from. Some users are given permission to create new records. You can launch a new record by selecting the Plus icon in the header to the right of the search bar. This Plus icon may or may not appear when you're on your App Homepage/Suite Dashboard or on an App Dashboard. However, you can always expect to access it from another record's View Page. Once you've launched the new record's form, you'll fill out the details of the new record and select the Submit button when you're done. That's about all there is to it! Hopefully you're feeling right at home in your Onit environment. If you run into any questions or issues while using Onit, contact your company's Onit representative. This page contains privileged information. Please ask for Onit's permission before sharing this page with anyone.